We met up with Banjo Brothers @ Interbike and they showed us some of their offerings for the new year. While they were showing us their stuff, we couldn’t help notice their fancy duds. 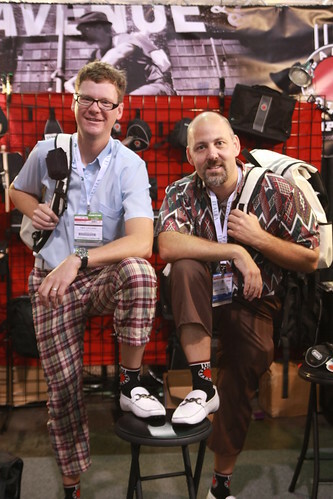 Eric and Mike were THE best dressed @ Interbike! Those pants, custom tailored just for the show. Ha…those guys were AWESOME! Great loafers, great look — and lots of really cool goodies to share. I like how they added that other side pocket on the commuter pack. That new model (Metro?) appears to add some much needed organization for some people. I’m off to check their website to see if any of the new stuff is up yet. Those look like really nice backpacks. I’m a messenger bag guy, but I do like the messenger-inspired packs. The roll top is quite like an Ortlieb pannier. How does Banjo Brothers bring their product to market for so much less than Chrome? Their workmanship looks excellent, so why so cheap? Are they outsourced to indentured servant Chinese laborers? If that’s the case, I’m torn. Like the bag, hate to support outsourcing. Still, an excellent price for a quality bag. And they look cool and modern. On a different note—how did BB’s line of traditionally styled canvas bags sell? If someone would make a canvas and leather cycling specific messenger bag, I’d be all over it. Brooks makes one, the Barbican. 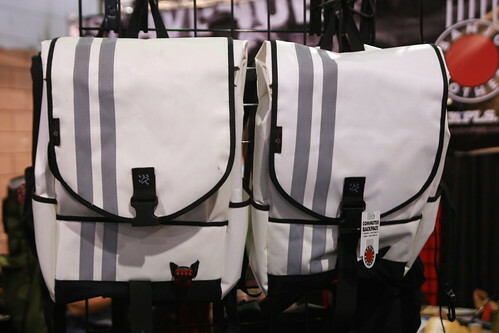 It’s a really cool bag but Brooks wants $300 or so for it. No way. I wonder if I could commission such a thing for less than $300. Oh damn. Those are some fine looking bags. If I wasn’t in love with my panniers, I’d get one of these. As it stands, commuting in Texas with a backpack != fun. Banjo Brothers uses overseas manufacture…I don’t know anything about the factories they use, but I suspect they check them carefully if the guys from BB are any indication. They’re good people. The Barbican is a fail, in my book — no cross-strap to keep the thing from flying around. It sure is pretty, though. Minnehaha does have a canvas shoulder bag with leather bits. Not what exactly what I’d call a messenger bag, but it does have a cross strap. And after checking out the BB site, it looks like the white pack has the dual side pockets- the original black ones just have the one. We have two of their waterproof panniers and they seem to work just fine (no prior experience for comparison).